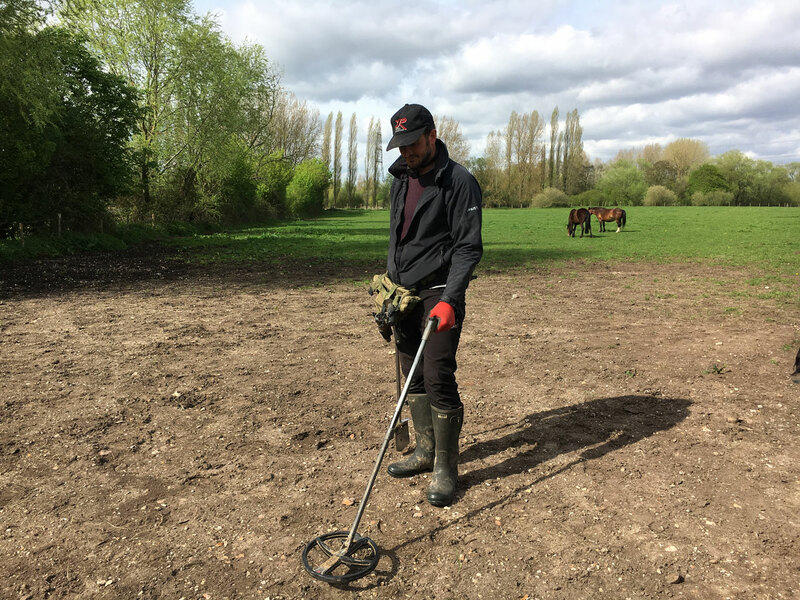 My fascination with metal detecting began in the early 1970’s when I purchased my very first detector, back in the day Victorian and Georgian coins were plentiful, but that appeared to be my limit. By the middle of the 1980’s, I had become a family man and my detecting days had become less frequent; eventually the detector went to the loft. 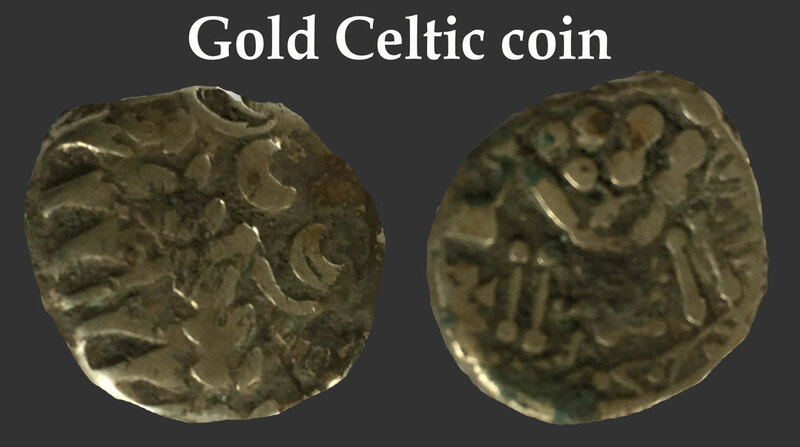 Just a few years ago, however, another detecting friend of mine from those earlier days suddenly began making more frequent visits to show me some of his amazing recent finds. Amongst his booty of usual debris were bronze Roman coins, brooches, crotal bells and silver hammered coins. ‘You’ve got to get yourself a Deus mate, they’re amazing’ were his exact words; so I did and he was spot on, they are!!!! Having introduced my business partner Alvin Robinson to metal detecting several years ago, he too had caught the bug. 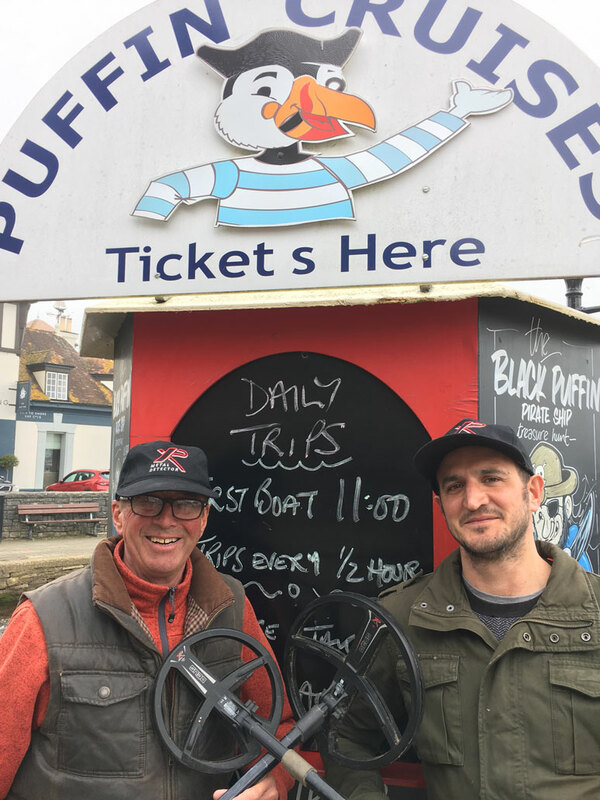 The Team Deus Duo, who were not renowned for overworking, made a concerted effort to operate boat trips from Easter through to October, giving us both ample time through late autumn, winter and early spring to either maintain our two vessels or go detecting……. no contest! There’s always a mad dash to get a fresh lick of paint on the boats just before the Easter holidays!!! A couple of years ago while discussing some of my detecting stories with a good friend of mine, Kit Layman, I offered Kit an invitation to join us for a spot of detecting. Being a very keen angler, detecting was the perfect hobby during the fishing off-season and Kit was very enthusiastic. I gave him a magazine and highlighted the appropriate Deus machine that he should purchase, the Team Deus Duo had become a trio!!! Although Alvin and I already had access to enough land to last a lifetime, Kit also had the potential to access quite a few acres. Initially we took Kit to a nice easy winter wheat field, good signals and easy digging, the perfect place to get in tune with his new Deus. 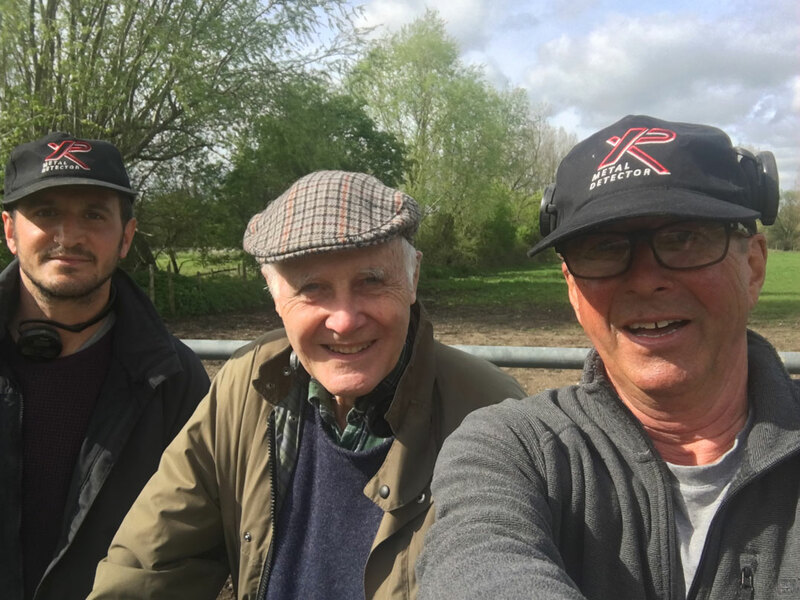 By the second year, the Team Deus Trio were also visiting the occasional field through Kit’s connections, although many of these fields were quite small, their locations were interesting. Using Google Earth I had been researching the various fields in this area. On one particular image, I discovered a more than interesting circular area of shaded grass, the location and diameter of this circle conjured those detecting thoughts of a potential Celtic dwelling???? The next day that the trio were heading out detecting, I produced my Google Earth print off, along with the declaration, “There’s a remote possibility that I may have identified the location of a Celtic dwelling’. My findings were met with the usual scepticism, with Alvin dubbing the field “The Celtic Field”. The hard stony soil in “The Celtic Field” did not retain moisture and drained extremely well. Although the weather had been damp, we had not seen any serious rain fall for several weeks and locating a half decent signal was proving more difficult with each visit. Alvin and Kit were suggesting another field with lighter soil based on the easy digging option, whereas I, on the other hand, was desperately keen to start the day on “The Celtic Field”. The serious amount of rain that had fallen the previous day would have given the ground a good soaking and fresh wet soil would potentially produce better signals!!! Within five minutes of entering “The Celtic Field”, Alvin’s first dig of the day produced a badly worn Roman Sestertius, his second signal proved to be an extremely nice Celtic silver stater of the Durotriges tribe. Concentration levels were at a high and with the atmosphere buzzing. Was Garry’s Celtic dwelling theory remotely possible!!!! Alvin’s third signal was weak and scratchy with an iron buzz and after removing the turf and digging a further six inches, the signal appeared to have vanished completely, probably a plough end! Alvin filled the hole and carefully replaced the turf. We had only been detecting for approximately twenty minutes when Alvin had another weak and scratchy signal, however, this time with the turf removed the target was still there loud and clear; bang in the middle of his twelve inch diameter excavated hole, now at a depth of approximately eight to ten inches, Alvin’s pinpointer was squealing like a goodun. Was this going to prove to be one of those annoying twelve inch deep beer cans, or had the “Celts” really been here, we were getting close!!! Alvin very carefully continued excavating slightly deeper. 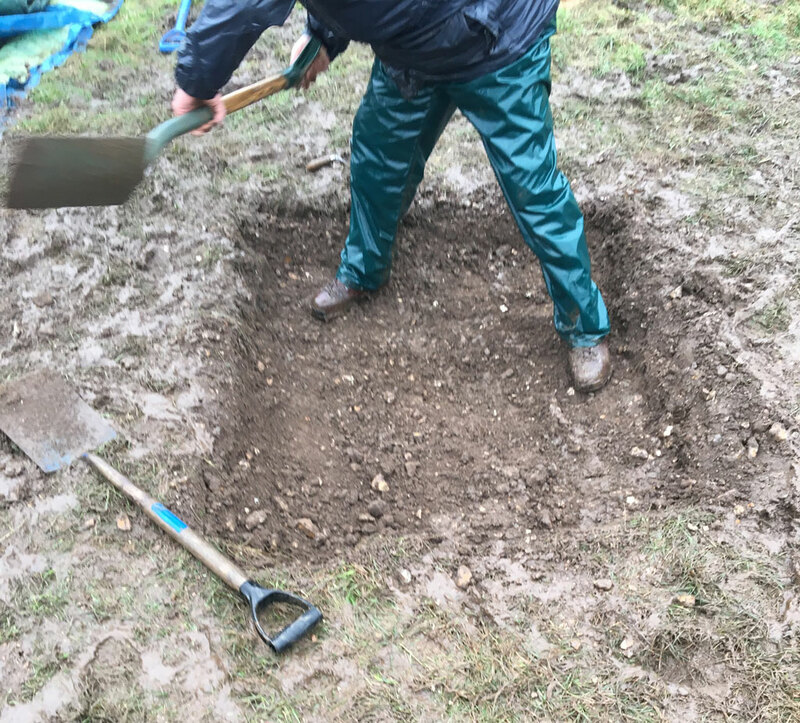 The soil amongst the mass of varying sized stones was light brown in colour but, suddenly at this depth, there was a conspicuous change in colour and a four to five inch diameter circular patch of black stained soil became apparent. With a little imagination, there was also the potential edge of a grubby looking coin!!!! Alvin was now using extreme caution and very carefully continued scraping away the brown coloured soil from around the blackened circular patch. 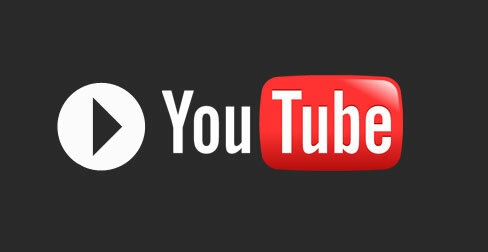 A small egg-sized clod loosened and, in that swift moment, imagination became reality, BINGO! 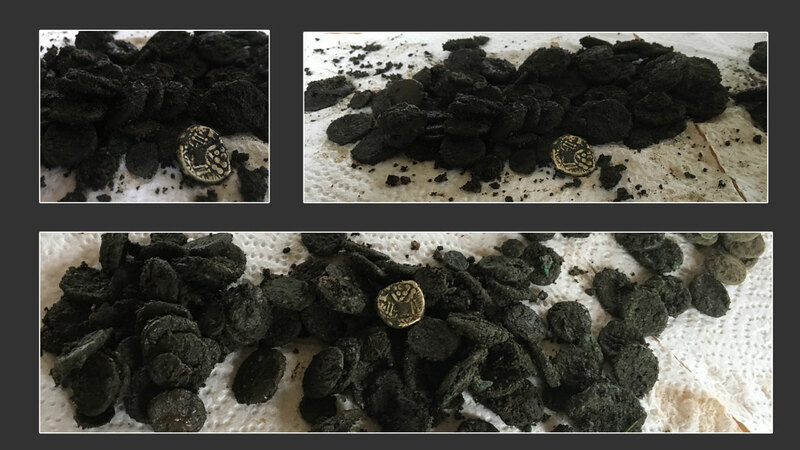 Although the silver coins were heavily tarnished with verdigris and char-stained black soil, it was blatantly clear that some of these “blobs” of coins were definitely staters, half staters and quarter staters, we had achieved every detectorist’s goal, we had found a hoard!!!! The Trio stopped digging. Unbeknown to the other members of Team Deus, Alvin had stored the area FLO number on his phone just in case this moment should ever occur!!! We made contact and were advised that a team could be at the location the next day…… we filled the hole, replaced the turf and felt extremely anxious about leaving it!!!! 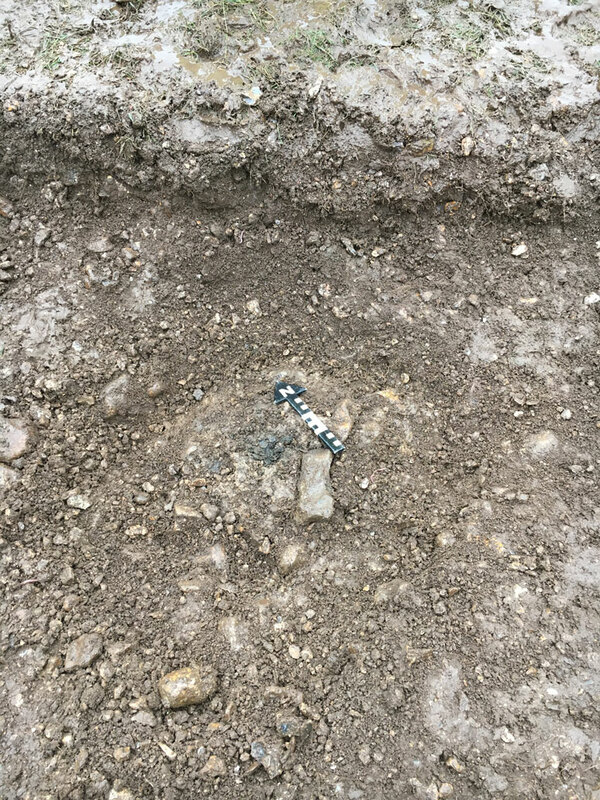 Having re-buried our hoard with its unknown quantity of coins, Alvin began to re-dig the location where the signal had previously “gone quiet on him”, it was less than three metres from the now re-buried hoard. 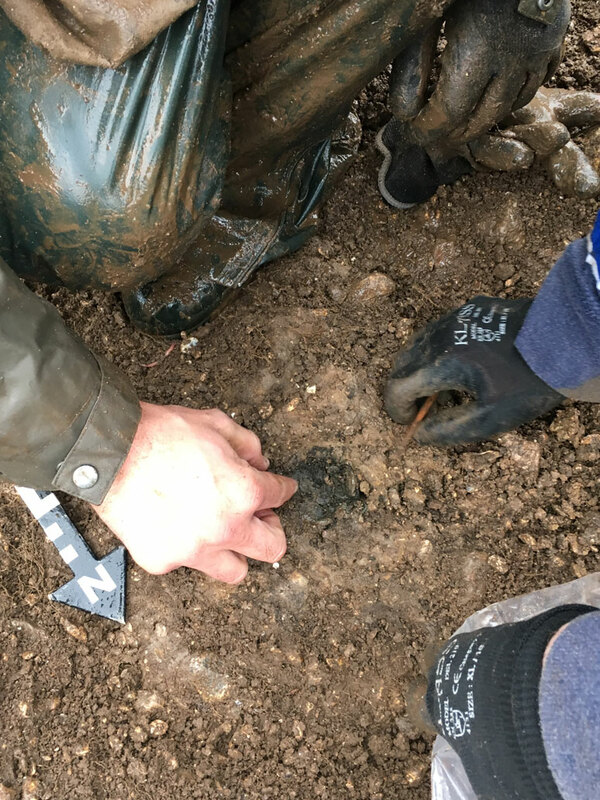 The pre-dug soil was easy to remove and at a depth of approximately eight inches, again there was still no signal; however, digging just a little deeper – “voila” the pinpointer went berserk……a heavily alloyed blob of Celtic silver weighing in at just over half a kilo. OMG … could things possibly get any better? The rest of our detecting day was rather insignificant, to say the least!!!!! The next day Kit had arranged to meet the FLO team at a designated location and direct them to “The Celtic Field” while Alvin and I went to the hoard site to re-excavate the hole in preparation for the arrival of Richard Henry and his entourage. As the team began to congregate at our hole in the ground, I said to Alvin and two of the archaeologists who were now present “I’m just going to check a signal that I hadn’t bothered digging yesterday”. This signal was approximately seven to eight metres from Alvin’s hoard and, not surprisingly, the weak and scratchy signal had not changed and was exactly the same as the previous day. Can I be bothered??? For no other reason than its proximity to the first hoard, I decided to dig it anyway and the rest is now history; at between ten to twelve inches deep there was the hallmark, a four to five inch diameter circular patch of black stained soil and BINGO, the Deus Double had been achieved in twenty four hours!!!!!! Alvin’s XP Deus hoard contained approximately one hundred and eighty silver Celtic staters, half staters, quarter staters and one solitary Celtic Gold stater, many of the coins were encrusted with verdigris and charcoal stained soil. Garry’s hoard consisted of between eighty five to ninety encrusted silver staters along with a stunningly beautiful shard of flint blade. Also, with the ground being hard, stony and incredibly difficult to dig, these four to five inch diameter holes would have been virtually impossible to create. 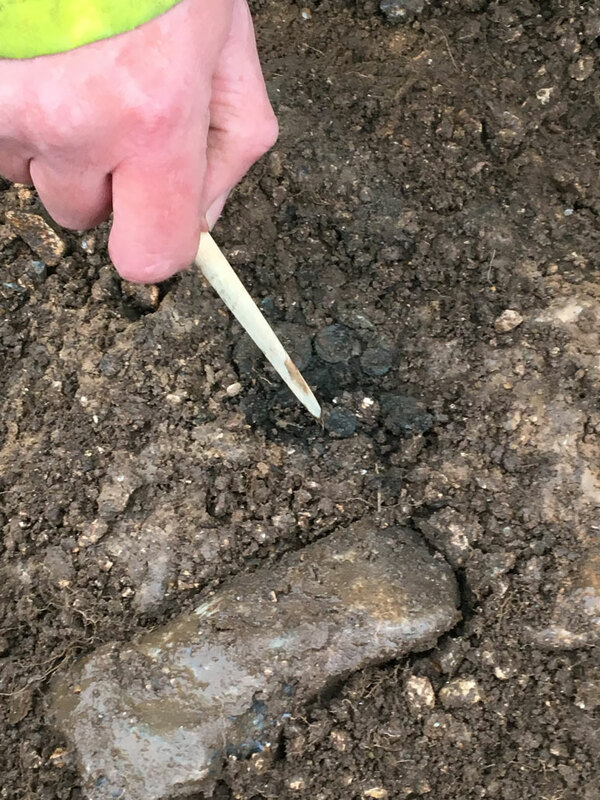 They were probably not dug by hand but could have been made by driving burnt, pointed, wooden stakes in to the hard stony ground, changing the stakes frequently for a freshly charred, pointed implement that could relatively easily penetrate to the desired depth…….? Hence the black charcoal staining in the soil….??? Watch this space for more XP Deus adventures. Be a member of the XP world-wide team – If you have a story with good quality pictures or a nice XP find please send it in we would like to hear from you.